Wide silver ring, thick silver ring, domed silver band, unique wedding band, Keum boo gold ring, modern silver band. 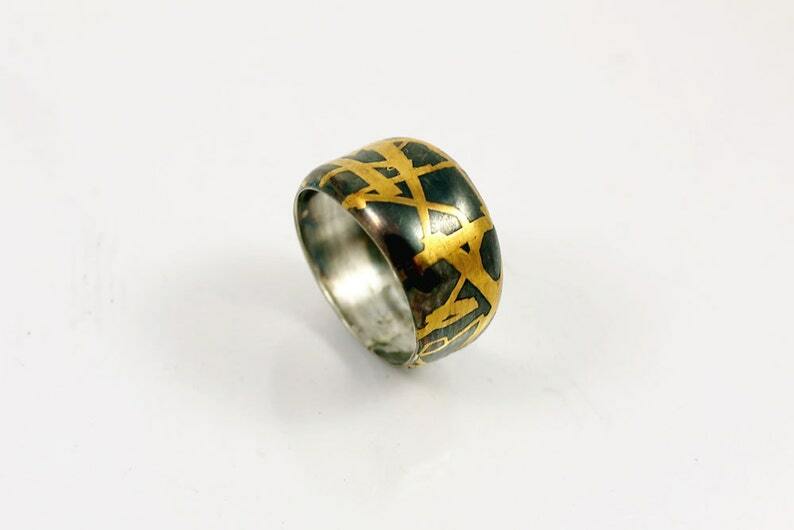 This unique wide silver band is part of our Keum boo collection. Each ring is a OOAK creation and is made to order. It is about 11-12mm wide, slightly domed and is a little less wide at the base for comfortable wear. The last two photos show some of our other items made in this ancient Korean technique, and a taste of the work process involved in making them. Please notice that the black oxidation will get a little less accentuated over time and the silver tones will become a dark gray. This is a natural process, not a defect. When ordering a custom ring, please take into consideration that the ring you will order will look slightly different from the one in this picture. We make each ring from scratch and each ring is a unique OOAK creation. Please be sure of your ring size when ordering a made to order ring, as there is a fee to re-size a made to order ring, and not all designs can be re-sized. Have any questions about this ring? We will gladly answer! Silver tie bar unique 24k gold and silver Keum boo tie clip, wedding accessories, Christmas gift for him.